The function calculateKd does the calculations and requires the concentration of the second solvent, a chemical basis, and the size of the pores. The optional arguments are the relative adsorption strength of a column and temperature, but keep in mind that they are experimental. 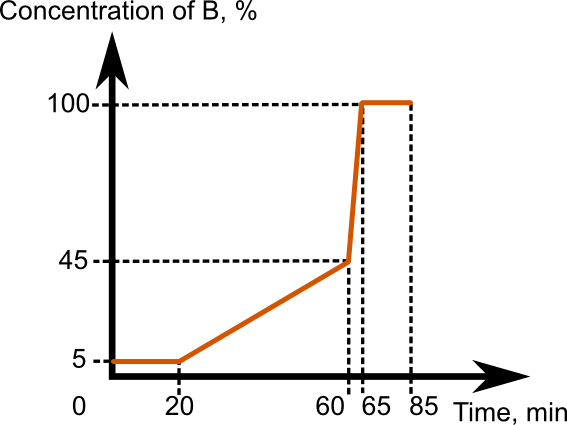 The shape of a gradient describes how the concentration of component B changes over time. It is implemented as a list of points, each point telling what the concentration of component B should be at given time. The solvent composition between these points is calculated using linear interpolation. the final flushing step at 100% of component B over 20 minutes. 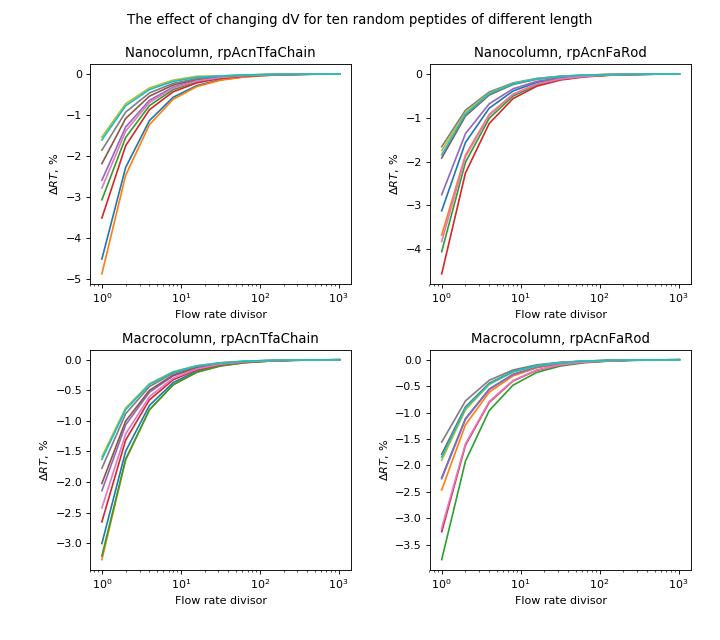 std::cout << "The retention time of "
<< peptide << " in the custom gradient is "
If you need to change the predefined values of physicochemical constants, you may edit an instance of ChemicalBasis. The ChemicalBasis class documentation contains further information on all the parameters it contains. You cannot change the label of a ChemicalGroup. This is the case because the label of a ChemicalGroup is also used in a ChemicalGroups map of ChemicalBasis. If you still want to modify it, remove this group and add a new one with the same chemical properties but another label. Do not modify the predefined chemical bases. You cannot break this rule in C++, since the predefined bases are made constant there. But in Python there are no constants, and you can accidentally modify variables pyteomics.biolccc.rpAcnFaRod and pyteomics.biolccc.rpAcnTfaCoil. You should avoid this since you can easily forget about it later and use these bases as if they were intact. If you need to derive a new basis from a predefined one, use an alternative ChemicalBasis constructor. This constructor requires a name of predefined chemical basis and fills a newly created instance with the corresponding data. Arbitrary changes in a chemical basis are likely to worsen the accuracy of prediction. The constants stored in a chemical basis were found using a combination of specially developed LC experiments and calibration algorithms. These data correspond to the local maximum of predicting ability for a given combination of solvents and stationary phase. According to our experience, it is unlikely that a change in a single constant will rise the accuracy of prediction. If you need to adapt BioLCCC to a custom retention chemistry or another model of a polymer, you need to conduct the whole calibration procedure which includes the LC-experiment with the calibration mixture and the further data processing. // Deriving a new ChemicalBasis instance from a predefined one. // Changing the bind energy of a chemical group. std::cout << "The bind energy of E is "
std::cout << "The bind energy of -NH2 is "
// Adding a new chemical group. The energy is not valid. // it will ruin the accuracy of prediction. std::cout << "The monoisotopic mass of " << peptide << " is "
# Deriving a new ChemicalBasis instance from a predefined one. # Changing the bind energy of a chemical group. # Adding a new chemical group. The energy is not valid. # it will ruin the accuracy of prediction. Once again, libBioLCCC C++ API documentation contains the full list of available parameters of ChemicalBasis. Sequence parsing is a process in which a text sequence is translated into a list of chemical groups. The resulting list begins with the N-terminal group, continues with the amino acids and ends with the C-Terminal group. where V is the volume of binary solvent pumped through the column, VR is the retention volume of a substance, VP is the volume of pores and V0 is the dead volume of the chromatographic system. The following picture illustrates the effect of changing dV on the accuracy of RT prediction for ten random peptides of different length, from 5 to 40 amino acid residues. The x axis denotes the divisor used to calculate dV as dV = flow rate / x. As you can see, for most peptides dV = flow rate / 20 is enough for the most accurate result. However, for those who use non-standard gradients with sharp or short steps, we recommend to find the required dV using the code from this example. Also, starting from the version 1.2.0 a new integration routine is used. In the previous version of calculateRT, the expression under the integral was summed until it was greater than 1.0. The obtained value of retention volume was therefore a multiple of dV and the RT was a multiple of dV / flow rate. Now the integral is taken until the sum equals 1.0 precisely, i.e. the last dV increment can be taken partially. It significantly increases the accuracy of prediction for big values of dV. If you need for some reason to emulate the old behaviour of calculateRT, set the backwardCompatibility argument to true. The standard RT calculating procedure recalculates the coefficient of distribution at each step of integration. There is no need to invoke these computationally-intensive formulas for each value of second solvent concentration. The value of Kd can be calculated only in several points distributed uniformly all over the concentration range, and than the whole function can be reconstructed using the interpolation. Because log(Kd) is a slowly changing function with a narrow range of values (see the figure below), we interpolate it and then recalculate Kd itself. The accuracy of this fast algorithm depends strongly on the number of interpolation points. The figure below shows how the difference between the new and the standard algorithms depends on the number of interpolation points. We recommend to use 21 interpolation point for both fast and accurate calculation procedure. To enable the interpolation, set the number of interpolation points in the numInterpolationPoints argument of calculateRT. The default value of numInterpolationPoints means that interpolation is disabled. # Using 21 interpolating points. BioLCCC uses two units to divide a polymer molecule into blocks. The first one is a conventional monomer, the building block of a molecule. In case of proteins it is an amino acid residue. The terminal groups are not considered as monomers, rather they are modifiers attached to monomers. But when we want to describe the conformations of a molecule, a monomer is not always a good unit. The standard model of a long polymer molecule is a chain of free jointed rigid rods, or Kuhn segments. The length of a Kuhn segment does not necessarily equal to the length of a monomer, and it even may not be its multiple. That is why we use another unit, the Kuhn length of a polymer. The Kuhn length is a minimal distance between two chemical bonds in a polymer backbone, whose orientations are almost independent of each other. The calculation procedure is the following. At first, we define the sequence of monomers in a polymer chain and calculate their effective adsorption energies. Then we divide the chain into Kuhn segments and assign each monomer to the corresponding segment. If a boundary between Kuhn segments crosses the monomer then the monomer itself is divided into two parts, and each is assigned to the corresponding segment. The effective adsorption of a Kuhn segment is a sum of effective energies of monomers it contains. If a segment contains only a part of monomer then its energy is taken proportional to its length. In the case of CHAIN model, the centers of this segments are modelled as adsorbing beads which are connected by freely jointed rods. For the ROD model, the centers of segments become the beads threaded regularly on a single rigid rod. The distance between the beads in both cases equals to the Kuhn length. The standard CHAIN model assumes that adsorption occurs only in a single layer, which is closest to the wall. This assumption can be generalized to the case when several near-wall layers adsorb the segments of a polymer chain. In terms of translational matrices it means that the second and further rows would contain the exponential terms. Because the energy of binding to these layers may differ, we introduce the vector of layer-specific values of adsorption strength. It is contained in adsorptionLayerFactors() function of a ChemicalBasis instance. The first element of the vector corresponds to the layer closest to the wall, second to the next and so on. The vector may contain an arbitrary number of elements, but it must be less than a half of the number of rows in the transitional matrix. This number is calculated as (pore size / kuhn length). Note that the relative adsorption strength of the column is applied to these values as usual. You may enable the linear approximation of binary solvent effective energy using the function setSnyderApproximation(true). If you are using the solvents other than water/ACN, you may set the corresponding densities and molar masses using the functions of ChemicalBasis. These values are used in the equation for the effective binding energy of a binary solvent.